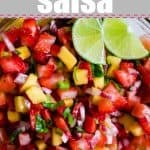 Strawberry Mango Salsa! This bright and flavorful salsa is the perfect combination of sweet and spicy. This salsa is great for dipping with chips, putting on tacos, or even spooning on top of some grilled fish! 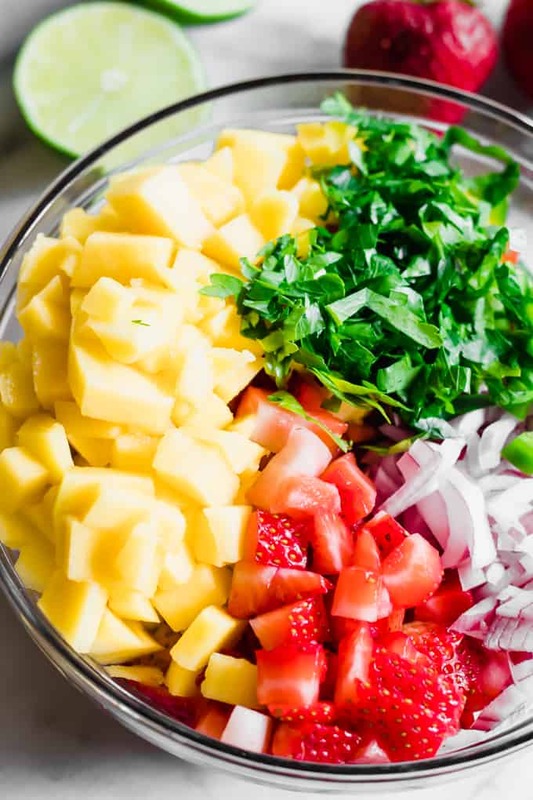 The epitome of spring and summer this colorful salsa is a great finishing touch to your summer meals! 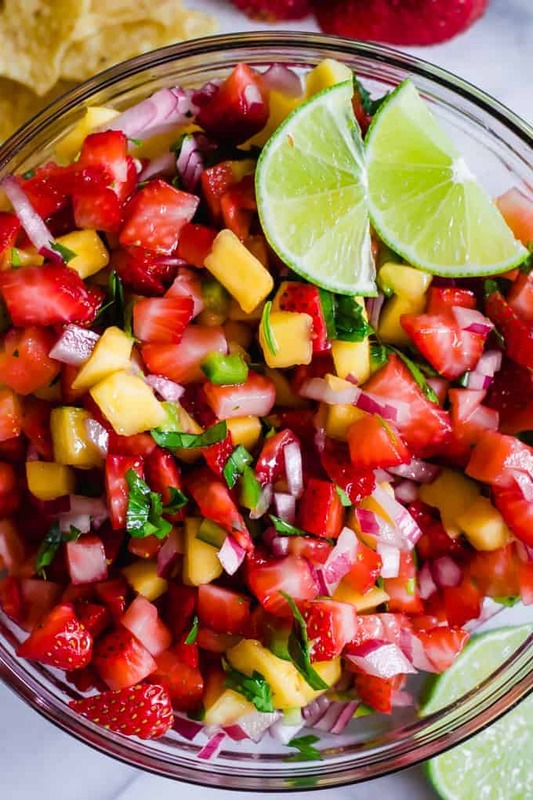 This strawberry mango salsa is bursting with the flavors of summertime. Loaded up with fresh strawberries, mangos, red onion, and jalapeño. Drizzled with fresh lime juice and a bit of honey for added sweetness. 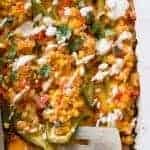 How to eat this Strawberry Mango Salsa? 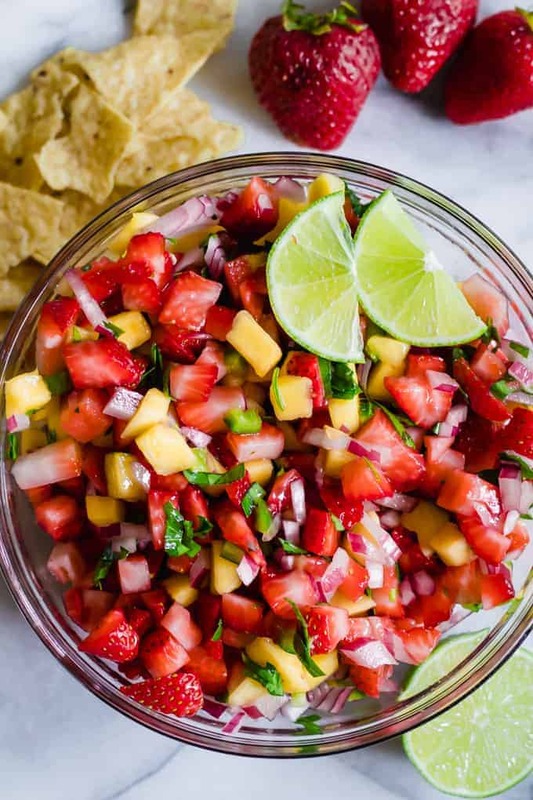 Serve this strawberry mango salsa with chips. 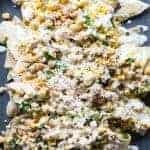 Or even some cinnamon tortilla chips for a sweeter snack. Serve on top of some grilled fish or chicken. Add to a salad for a sweet, fruity addition. 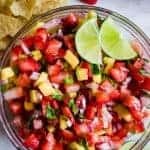 How to make Strawberry Mango Salsa? This recipe is super simple and a chance to show off your knife skills. All that’s involved is a good cutting board (affiliate link), a sharp knife (affiliate link), and a bowl (affiliate link). The goal is to get the pieces all about the same size. So the strawberry and mango will need to be cut to approximately the same size. I like to do smaller chunks so that it’s easier to scoop onto a chip. The jalapeño I dice a bit smaller, just because I don’t like biting into big pieces of jalapeño. The red onion can be diced to about the same size as the jalapeño. 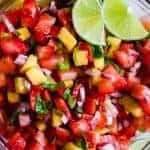 WANT TO TRY THIS STRAWBERRY MANGO SALSA? 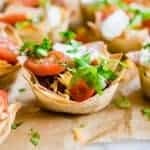 PIN IT TO YOUR APPETIZERS OR PARTY BOARD TO SAVE FOR LATER! Store in refrigerator. Serve cold. Can be made ahead. As the fruit sits in the lime juice it will soak up flavor and soften. If making in advance more than a day wait to put the lime juice and honey on the fruit. Add this prior to serving. I love the mixture of sweet and spicy…always a great combination. 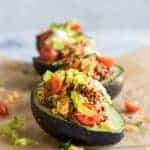 This recipe sounds delicious…thanks for sharing! Thanks Jodee! Thanks so much for stopping by. Hope you’re having a fantastic week!